Multiple reports and confirmations (including one by the Brewers) have come out this early Sunday afternoon which have the Milwaukee Brewers trading RHP Marco Estrada away. Estrada, 31, gave up a league high 29 home runs in 2014 splitting time between the starting rotation and bullpen. He was much more effective as a relief pitcher in 2014, something that’s a bit of a disconnect from earlier in his career. 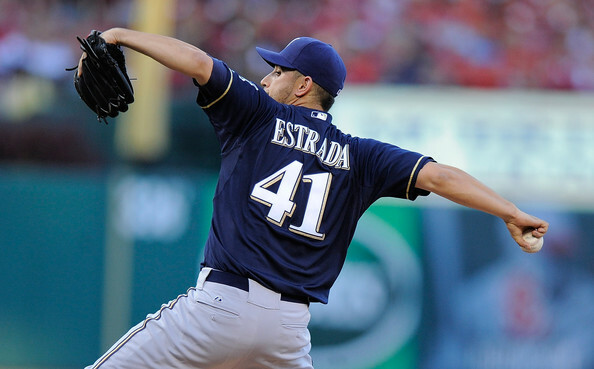 Estrada was originally acquired by the Brewers off of waivers from the Washington Nationals after the 2009 season. Estrada made $3.325 million in 2014 and in his upcoming third time being arbitration eligible, he was set to receive a significant enough raise that he may have ended up as a non-tender candidate. That’s because the Brewers didn’t have a spot for him in the starting rotation where he’s a bargain. He’s quite pricey as a long-reliever. He will finish his Brewers career with a 23-25 record in 139 games (70 starts). He’s amassed a 4.11 ERA in 521.0 innings pitched. Doug Melvin struck a deal with the Toronto Blue Jays, who he has dealt with in the past. In return, the Brewers have acquired 1B Adam Lind. Lind, also 31, has had an up-and-down career in Toronto, the only organization he’s known as a professional since being drafted in the 3rd round of 2004. Lind debuted as a 22-year-old in 2006. In 2014, Lind spent some time in the minor leagues to get his groove back, more or less. 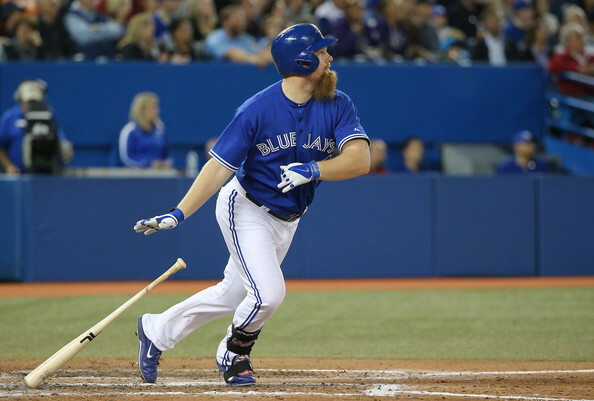 In his 96 games on Toronto’s roster, Lind slashed .321/.381/.479 in 318 plate appearances. That includes an incredibly hefty platoon split though. In 2014 he his .354/.409/.533 against right-handed pitching (which is the majority as we all know) but an incredibly different .061/.161/.061 in 37 plate appearances. That’s four walks, just two hits (both singles), and 11 strikeouts. 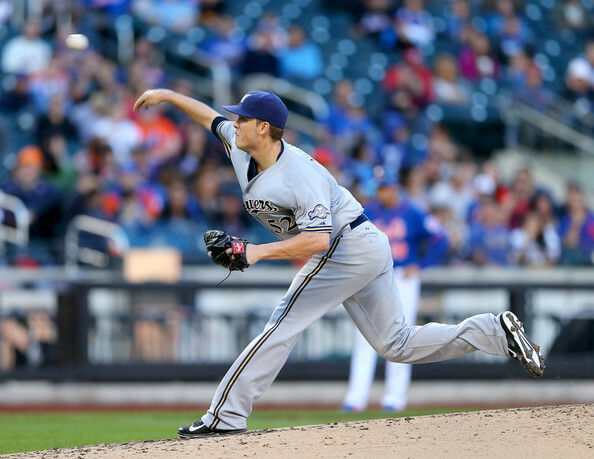 The Brewers are hardly strangers to platooning. They carried season-long platoon at both first and second base last season and due to some injury concerns, they basically played with one in left field down the stretch as well. They might be committing to Scooter Gennett full-time at the keystone in 2015 (though I think they’ll wind up in a soft platoon at best), so it would allow them room to have another first base platoon next season. Looking at the numbers, they almost have to. New hitting coach Darnell Coles can only do so much, after all. Lind will makes $7.5 million in 2015. His contract carries a 2016 option as well valued at $8 million with a $500 thousand buyout. 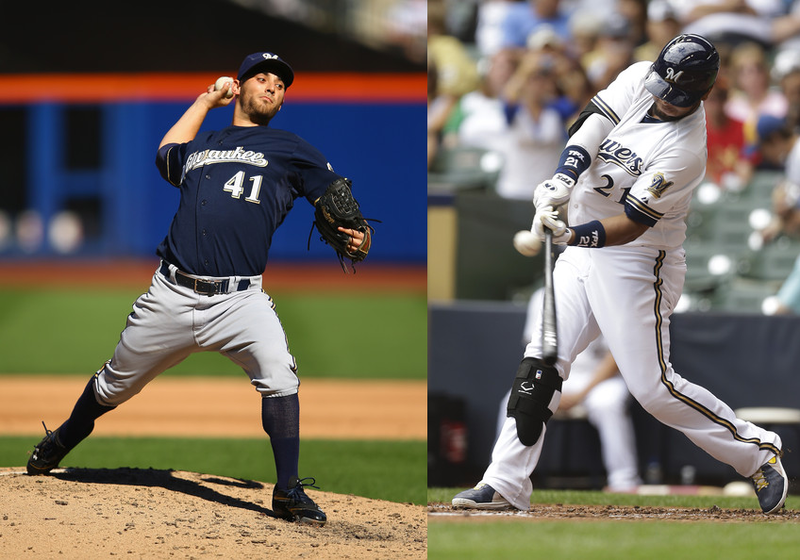 After an expected three day hiatus, “Brewers By the (Jersey) Numbers” is back as we are 41 days away from Opening Day. I call the hiatus expected because both 44 and 42 are retired by the Milwaukee Brewers and while 43 used to be worn by Randy Wolf, it was taken over by bullpen coach Lee Tunnell after he joined the coaching staff back during the 2012 season. The 30-year-old Mexican native began his 2013 reporting to Brewers camp but quickly joined his Brewers teammate Yovani Gallardo by leaving camp to participate in the World Baseball Classic. He didn’t have the results he wanted in his one start for Team Mexico and reported back to Maryvale Baseball Park ready to improve on 2012’s solid if truncated campaign. Unfortunately, more health issues were in the cards for Estrada in 2013. After missing more than a month of 2012 due to a right quadriceps injury suffered while running the bases, Estrada pitched just 138.1 innings across 29 appearances (23 starts). In 2013, Estrada could only muster 128.0 IP over 21 starts. That was because of a strained left hamstring suffered in a start on June 3rd. It was especially frustrating because I remember after that game that Estrada told the media that he didn’t think it was very serious at all and was optimistic about making his next start in five days. He wouldn’t pitch again for Milwaukee until August 7th — over two months later. And that’s been the major problem with Estrada to this point. He puts up good numbers. Very solid rates, a strong set of peripherals to go along with his traditional stats and advanced metrics. For example, he posted a 3.87 ERA in 2013 nearly matching his FIP of 3.86. He was a little down on his strikeout rate last year, but improved on his WHIP in posting a career best 1.078. So the thing is, when Estrada was on the mound, he was putting up solid performances more often than not. He had 12 “Quality Starts” and only five starts I would consider truly bad, and one of those was the game in which he hurt him hamstring. Estrada also finished the season very strong. He had six quality starts in the nine he made after returning from the disabled list, including his last four of the year. Over his last six starts he struck out 44 in 41.2 innings pitched and walked only 10 total. 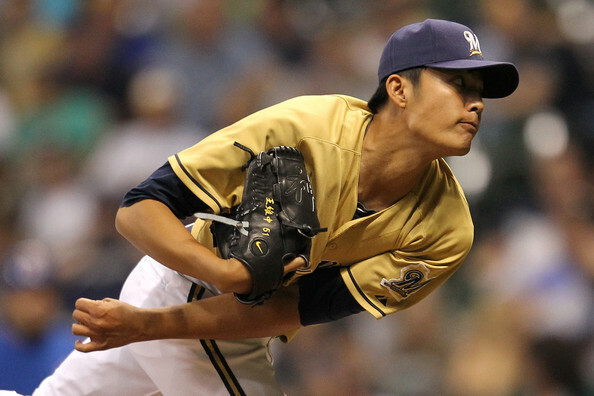 He’s a quality rotation option for the latter half of a rotation and the Brewers have been capitalizing on that when they can. Barring injury, Estrada should break camp firmly entrenched as a starting pitcher for the Milwaukee Brewers. Whether they throw him fourth or fifth will probably have as much to do with who pitches third in Ron Roenicke’s rotation as it will anything else. Wily Peralta has the higher ceiling and he also throws much harder, but he’s much more inconsistent and has had some trouble getting out of the gates the last two seasons. Some managers enjoy mixing up styles of pitching in their rotation. If Kyle Lohse pitches third, for example, that style of thinking would lead to Peralta fourth with Estrada going fifth. Regardless of who he follows though, Estrada needs to be in the rotation. I’ve made no secret that I prefer Estrada to start but the numbers just flat out back it up. Here’s a direct link to his career splits by role (Starter vs Reliever) at the infinitely useful Baseball-Reference.com. The sample size as reliever is a little smaller, but it’s a clear distinction. Let me bottom line it. Estrada needs to start. He will start, barring injury. He’ll contribute solid numbers and help the Milwaukee Brewers win baseball games.